People travel for so many reasons. When they travel for leisure, the reason is almost always about wanting to relax, unwind, quench their gratification, recharge so that they can tackle life’s challenges when they return home and be inspired. Those travelling for business seek efficiency, smoothness in travel, savings, opportunities, closing deals and make more money for their respective organisations. Whatever the reason may be, the travel should contain one element: substance. What do we mean by substance when it comes to travel? To us, it means that the travelling has to be meaningful, impactful, educational, eye-opening and allows the traveller to make emotional and spiritual connection with the people and place that they are travelling to, and not just engage in only hedonistic activities like excessive shopping, excessive eating, unnecessary spa-ing, selfieing (is there such a word?) to show off and excessive partying. As such, we would like to recommend that when you travel to one place, try to look at it from a different perspective, maybe consider questions like “What kind of people inhabit this place? What are their origins?”, “How do the people here get by?”, “What makes the whole economy of the place tick?”, “Why are the conduct of the people here different? What is the people’s culture?”, “What are the positive aspects of the destination that we can take home?”, etc. It would also be great if we could interact more with the people from that place at a deeper level so that we can understand their psyche, how they look at life and how much effort they have to put in to make the place work. Sometimes, during travel, we are so preoccupied with our own agendas and itineraries that we forgot to stop and absorb the place that we are in. Instead, why not take time to observe the place, ask the locals questions about their culture, and reflect on their lives and the environment they inhabit? 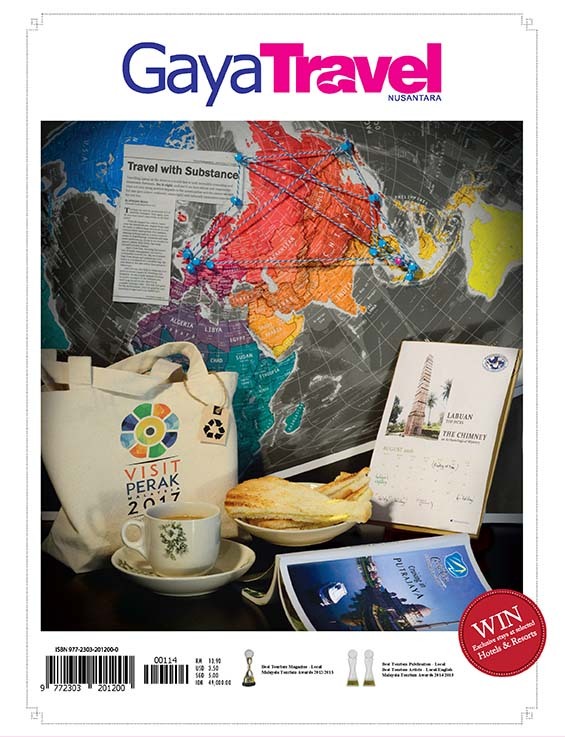 In the pages of this issue, we hope that we are able to bring you ideas on where you can head to so that you can travel with substance: experiencing the eco-tourism attractions in Putrajaya and Pahang (page 56); doodling your way around Kuala Lumpur to look at the city with fresh eyes (page 62); hunting for local delicacy in Kuantan (page 70); savouring delicious local fruits at Perak’s agro-tourism farms (page 76); relishing Lanna culture in Chiang Mai (page 88); getting in touch with your inner child at Tokyo Disney Sea (page 92); shopping for Okinawan handicrafts (page 96); and see selected Western European landmarks with your own eyes (page 100). No matter how far, how long and in what mode, we just want to recommend this when you are travelling: take the time to actually understand the place that you are heading to, its people and culture, and see what positive aspects from that place that you can learn and apply back home – now that is what we call travel with substance. Cover Art Direction by Miscellaneous Minds. Cover Photoshoot by Iqmal Fauzee.